Arizona Animal Welfare League & SPCA Medical Miracles Fund. The fund - established so donors could support the extra medical expenses and efforts that AAWL & SPCA takes on as part of its no-kill mission - seeks donations. For more information on how to donate, visit the Arizona Animal Welfare League and Society for Prevention of Cruelty to Animals and click on the Miracles Fund link on the home page. Arizona Animal Welfare League & SPCA military adoption discounts. Veterans and active military can get 10 percent off adoption fees or a free leash and collar for their new pet when they adopt, they can take a 10-percent discount on any training class offered by AAWL & SPCA. The shelter is located at 30 N. 40th Place, just north of Washington and east of 40th Street, in central Phoenix. Adoption hours are 11 a.m. to 7 p.m. Tuesday through Friday and 10 a.m. to 6 p.m. Saturday and Sunday. For more information, visit AAWL & SPCA and click on Adoptable Pets. Arizona Animal Welfare League and SPCA “Teen Tracks” program. The project-based program provides a rewarding experience for teens 13 to 17 who love animals and are thinking of careers working with dogs, cats, horses or even exotic animals. Applications for the next semester of Teen Tracks are due Sept. 3. The next program starts September 17. For more information about the Teen Tracks Program, contact Michelle Ramos at MRamos@aawl.org or 602-273-6852, ext. 121, or Rachael Gardner at RGardner@aawl.org, or 602-273-6852, ext. 122. What's at the End of Her Amazing Trail? 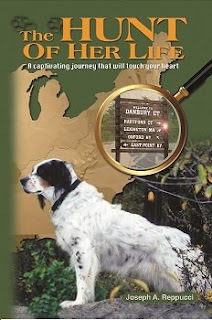 Find out in THE HUNT OF HER LIFE, a nonfiction book about Samantha, an English Setter rescue dog, by longtime newspaper journalist Joseph A. Reppucci and publisher of MySetterSam.com. Samantha's powerful, uplifting story will make you smile, sob and will captivate you to the very end. Travel with this bird dog and her master along a trail filled with surprising twists, sudden turns, mystery and even what some call a miracle. And when the journey is finished, you may never look at people and their pets, motherhood - and perhaps even God - in the same way. Pet enthusiasts will appreciate the deep bond shared between this unwanted rescue dog and the book's author who adopted her at age 2. Their unique closeness helps Samantha to twice defy certain death. Mothers will be touched by the relationship that the author has with his own mother. Their connection helps him to overcome many frustrations and overwhelming odds in his nationwide investigation to locate the birthplace of his unregistered rescue dog after she eventually succumbs to illness. Those who like suspense will be intrigued and fascinated by the crafty investigative journalism techniques the author uses to try to uncover his dog's family tree. And everyone will be in awe as they come to realize that God all along has been providing a guiding hand in Samantha's journey through life and astonished when they ultimately learn what is at the end of this rescue dog's trail. This premium full-color book with more than 60 beautiful color photos of dogs to help illustrate the story makes a perfect birthday or holiday gift for animal lovers of all ages. The Hunt of Her Life is must reading for anyone who has ever known the joy of loving a dog, and it is appropriate for teens and tweens with a little parental guidance. So go on the journey of your life and find out what's at the end of Samantha's amazing trail in THE HUNT OF HER LIFE. Marin Humane Sociey 2011 WoofStock. The concert - featuring music by Petty Theft and Jerry Hannan - will be held from 3 to 6 p.m. Saturday, September 17, at the humane society,171 Bel Marin Keys Blvd., Novato. The event will include a raffle, pet-friendly prizes and food. Dogs are welcome. For more information, visit the Marin Humane Society. Marin Humane Society’s Special Human-Animal Relationships program seeks donations. Pet food and toys are needed to fill gift bags for clients and for distribution to shelters in Marin County. Financial contributions are also welcome and will be used to purchase additional gift items. The program provides a lifeline for more than 200 low-income seniors and disabled clients and their pets. Assistance is offered in the form of pet food, veterinary care, home visits, and emergency boarding for pets in the event of hospitalization of the client. Donations may be delivered to the humane society at 171 Bel Marin Keys Blvd., Novato. through the end of the year. Visit the Marin Humane Society for more information. Humane Society of Pinellas fourth annual Cruising For Critters. The event will be held on October 1 with motorcyclists meeting at Eve’s Family Restaurant. Registration is 8 to 9:45 a.m. and the 53-mile ride will begin at 10 a.m. The event will include more than $5,000 in prizes and an after party with vendors and live music. Visit the Humane Society of Pinellas for more information. Animal Rescue League of Cape Cod's Yappy Hour. The event will be held from 5:30 to 7:30 p.m. Wednesday, August 31, at Laurino’s Restaurant, 3668 Main Street (Route 6A), Brewster. The event will feature free treats for dogs, free appetizers for people, a raffle and cash bar. Admission is a $10 donation to The Animal Rescue League of Boston’s Cape Cod branch, which is located in Brewster. For more information, call 508-896-6135 or visit www.facebook.com/arlcapecod. Blue Dog Shelter of Brockton golf tournament. The event will be held on Monday, Sept. 12, at Easton Country Club in Easton. Registration is 8 a.m. and shotgun start is at 9:30 a.m. The event will feature a silent auction, putting contest and hole-in-one contest. Registration is $125 per golfer, which includes a golf cart and dinner. For more information, visit Blue Dog Shelter of Brockton. First Baptist Church of Scituate blessing of the animals. The Rev. Barbara Welch wil perform the blessing from 11 a.m. to noon, Saturday, Sept. 17, on the lawn at the church, 660 Country Way, Scituate. For more information, call 781-545-0058 or visit the First Baptist Church of Scituate. Friends of the Plymouth Pound Walk for Animals. The event will be held on Saturday, September 10, at Morton Park (Little Pond) in Plymouth. Registration will be held at 10 a.m., a cookout at noon and a raffle drawing at 1:30 p.m. All money raised will be used to pay for veterinary care for Friends of the Plymouth Pound foster care program and low-cost spaying and neutering program. For more information, call 508-224-6651 or visit Friends of the Plymouth Pound. Friends of Plymouth Pound pancake fundraiser. The event will be held from 5 to 9 p.m. Monday, September 12, at the International House of Pancakes off Exit 5 in Plymouth. Friends of Plymouth Pound will received 20 percent of all sales, which will be used to care for homeless pets. For more information, visit the Friends of Plymouth Pound. Massachusetts Humane Society yard sale. The event will be held from 9 a.m. to 3 p.m. Saturday, September 17, the Massachusetts Humane Society's animal shelter, 87 Wharf Street, East Weymouth. Tables full of gifts for people and their pets. For more information, call 781-335-1300 or visit the Massachusetts Humane Society. Massachusetts SPCA annual Walk for Animals. The MSPCA will host three walks at 11 a.m. on Sunday, September 11, at Boston Common, at Aselton Park in Hyannis and at Spencer Peirce Little Farm in Newbury. This year's walks are in honor of service dogs, that aid police and handicapped citizens. For more information and to register, visit the MSPCA. Quincy Animal Shelter raffle for Boston Red Sox tickets. Two box seat tickets are available for the Friday, Sept. 16, game against the Tampa Bay Rays at Fenway Park. The game starts at 7 p.m. Raffle tickets are $5 each or three for $10. The drawing will take place Sept. 2. For more information, call the shelter at 617-376-1349 or visit the Quincy Animal Shelter. Quincy Animal Shelter wine and beer-tasting fundraiser. The event, presented by Frozen Freddies, will be held from 6 to 9 p.m., Friday, Sept. 23, at the Kennedy Center, 440 East Squantum Street. Atlas Liquors, National Wine & Liquors, Shop-N-Save Liquors and Blue Hills Brewery will provided beverages. For more information or to buy tickets, visit the Quincy Animal Shelter or call 617-376-1349. Scituate Animal Shelter's Happy Tails Walk. The event will be held from 10 a.m. to noon September 11 at Bare Cove Park in Hingham. A prize will be awarded to the person who collects the largest donation for the shelter. Register by August 26 and get am event T-tee shirt. For more information, call 781-544-4533 or visit the Scituate Animal Shelter. Standish Humane Society's 17th annual Doggiepawlooza and benefit walk for animals. The event will be held from 10 a.m. to 2 p.m. Sunday, September 18, at Wompatuck State Park in Hingham. Activities include dog contests, obedience training, animal behavior advice, music, food, raffles and vendors. Visit Standish Humane Society for more information. Humane Society for Greater Nashua's Sponsor-a-Pet. Makes a great gift in honor of family members and friends. For just $1 a day, you can ensure that one animal in the shelter receives proper nutrition and a safe place to live (including a warm bed and toys. Make it $1.33 a day, and you can ensures that one animal in the shelter gets medical care and a microchip, too. Visit the Humane Society for Greater Nashua for more information. Humane Society for Greater Nashua cell phones and ink cartridges recycle program. Donate your used cell phones and ink cartridges to the shelter to be discarded through the Funding Factory program. Individuals can drop off items at the humane society, 24 Ferry Road, Nashua. Businesses can receive prepaid shipping labels from Funding Factory with proceeds going to the humane society. Visit The Funding Factory for a list of qualifying cartridges and cell phones or the Humane Society for Greater Nashua for more information. Associated Humane Societies and the Moscow Ballet present the Great Russian Nutcracker. The performance - which will benefit Popcorn Park Refuge of Forked River, New Jersey - will be take place at 7:30 p.m. Wednesday, December 7, at the Strand Theatre in Lakewood. Five dollars of each ticket will go to help abandoned, injured and abused animals at Popcorn Park Zoo. To purchase tickets and simultaneously make a donation to the Associated Humane Societies, use the code “POPCORN” at the Strand Box Office in person or call Moscow Ballet 800-320-1733, extension 15. For more information, visit Associated Humane Societies. America's Family Pet Expo. The event will be held July 8 to 10 at the Puyallup Fair and Events Center, 110 9th Avenue SW, Puyallup, Washington. Activities the expo will feature include dog breed displays and education, dog grooming demonstrations, police K-9 demonstrations, a petting zoo, pony rides and an assortment of pet products. Adoptable pets also will be available. Visit America's Family Pet Expo for more information. Casper Humane Society pet photos by DeMaine Image. Sessions are held monthly at the shelter, 849 E. E St. A $10 sitting fee is charged, and pet owners can choose from several photo packages; price varies depending upon the package chosen. A portion of the $10 sitting fee is given to the CHS to help offset costs of having photos taken of shelter animal available for adoption. Visit www.demaineimage.com or www.chswyo.org for more information. Submissions to the Dog Days Events Calendar should be sent to mysettersam@rcn.com.